The campaign of acquiring data in survey orbit was very complex. On the second, fourth, fifth, and sixth loops, the strategy included collecting more than Dawn’s memory could accommodate in the half of an orbit in which it was over sunlit terrain. Therefore, during those orbits, mission planners incorporated instructions to turn away from looking at Vesta to allow the spacecraft to point its main antenna to Earth for five to six hours. That provided time to transmit enough of its precious findings to make room for still more during the rest of the passage over the day side. Thanks to the strategy to perform more observations than needed, even with the interruptions, VIR accumulated a fantastic wealth of information. The principal scientific objective of survey orbit was to collect 5,000 sets of spectra or “frames.” A spectrum is the intensity of light at different wavelengths, and each frame consists of visible and infrared spectra at 256 locations on Vesta’s complex and mysterious surface. By the end of survey orbit, Dawn had obtained well in excess of 13,000 frames, or more than three million spectra. Acquiring more than one spectrum of the same location is valuable, as different angles of incident or reflected sunlight allow scientists to gain greater insight into the mineralogical composition and properties of the material. 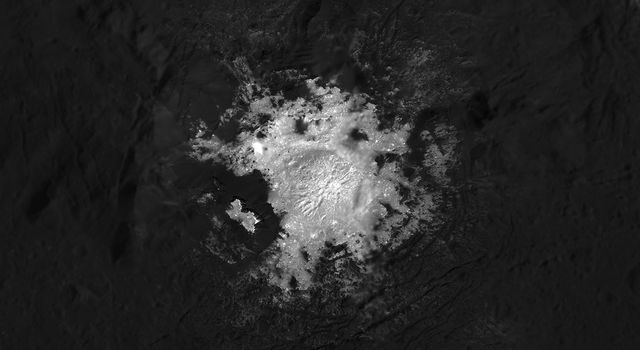 With an initial plan of observing 52 percent of the surface with VIR from survey orbit, the team is elated now to have spectra from about 63 percent. The science camera has similarly overachieved. The intent was to photograph 60 percent of Vesta, but the entire 90 percent not in the darkness of northern winter has been captured at least five times. With pictures taken from multiple angles, stereo views can be constructed; and images at different times allow features to be observed under varied lighting conditions. All of the camera’s color filters were used, providing coverage in the near infrared and visible. Until recently, Vesta was known as little more than a smudge of light, but now scientists have more than 2,800 photos from Dawn’s survey. A selection of stunning scenes of the latest world to come into the realm of humankind’s knowledge is here. As scientists pore through the treasure trove, they will continue to add their favorite views to that site. This mission has already revealed far more about Vesta than a flyby mission could. While much more data will be obtained during the rest of Dawn’s residence there, the six gigabytes from VIR and the three gigabytes from the camera so far are enough to keep researchers busy (and extremely happy!) for a very long time as they tease out the nature of this alien world. Even before the outstandingly successful survey orbit had begun, navigators were starting to plan the flight to the next science orbit. Throughout Dawn’s approach and survey orbit, they have been refining measurements of Vesta’s mass and therefore its gravitational strength. The closer Dawn has come, the better they have been able to detect variations in the gravity field that are due to the uneven distribution of mass within the protoplanet. With their improved charts of the waters around Vesta, they plotted the ship’s course, and it is now under sail. 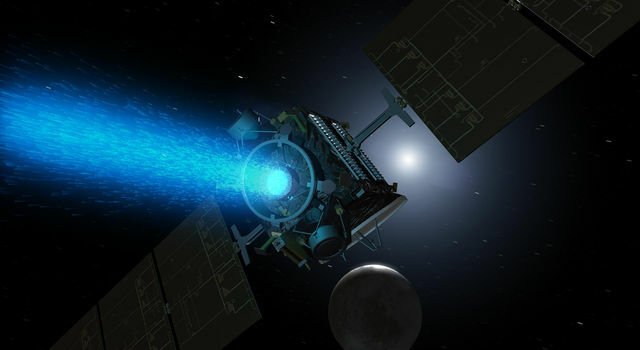 Thrusting with the ion propulsion system began on August 31 at 4:05 p.m. PDT, and this trip to the high altitude mapping orbit will take a month. 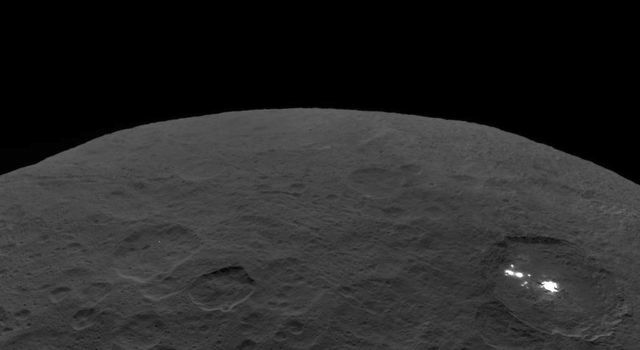 In survey orbit, Dawn was 2,700 kilometers (1,700 miles) above Vesta. Its next orbital target lies at an altitude of about 680 kilometers (420 miles). The separation between them may seem relatively small, but maneuvering in orbit requires far more work than may be evident simply from the distance. In addition, Dawn is doing even more than flying down to a lower altitude. Each of the observation orbits at Vesta is designed to optimize a set of scientific investigations. Scientists want to shift the plane of Dawn’s orbit in going from survey to HAMO in order to change the illumination presented to the sensors. Even as Dawn ventures closer to the giant that holds it in orbit, the splendid results of its first detailed survey of Vesta will continue to dazzle and excite us. The images and other data beamed to Earth are filled not only with scientific value but also with the exhilaration of discovery and the thrill of exploration. The drama upon beholding some of humankind’s first views of an alien world is something everyone can experience. After all, it is the collective passion for extending our reach beyond the confines of our terrestrial neighborhood and the shared hunger for knowledge of the cosmos that enabled an emissary from Earth to take up residence far from home, deep in the asteroid belt. There, our species’ yearning for noble adventures is now being fulfilled.